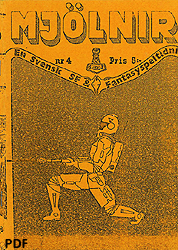 Inspired by early White Dwarf plus the s-f and punk fanzine explosion, we launched Sweden's first RPG fanzine Mjölnir in 1980. 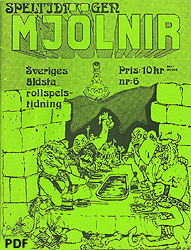 Co-founder Bo Jangeborg later wrote legendary computer RPG Fairlight, co-editor Anders Blixt went on to create Swedish RPGs Drakar & Demoner, Mutant etc while Martin today is an OSR illustrator. 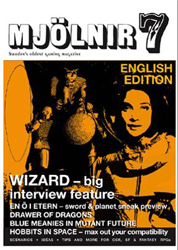 In 2016, Mjölnir was revived by Elfgrim Borðspil, publishing some issues in both English and Swedish. 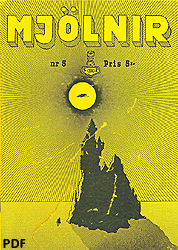 Buy original print copies of the MJÖLNIR fanzine, vintage 1970s fantasy posters, RPG modules and uncirculated White Dwarf magazines. 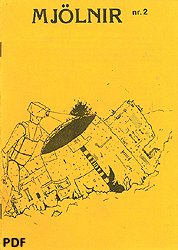 Limited, original items dating from the golden era of SF / fantasy / gaming available once again, as new old stock or 2nd hand, from The Wizard's Apprentice. Browse the web shop! 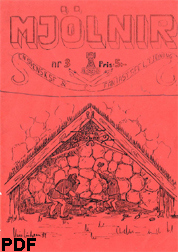 The special 10th issue of Mjölnir fanzine was published in Swedish only, as a 48 page printed paper edition in 40 copies, with hand printed artwork and bonus inserts. (For full content information, see the Swedish page here ). It is now sold out. 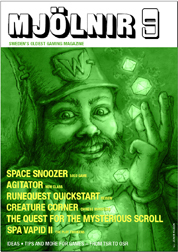 'Mjölnir 10%' is a free English language excerpt, containing 1 (one) feature from Mjölnir #10, the solo game 'Dungeon Shuffle'. Download the excerpt as a free PDF here. The foldout poster D&D 5 scenario from Mjölnir #10 is planned to be published independently by its authors: more information will be presented here as it becomes available. 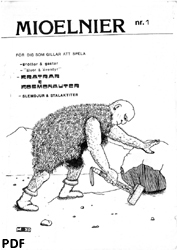 "very cool, very White Dwarfish, before they went house magazine"
"As always, (...) chock full of quality content"
"two solid issues in a row"
"'Tunguska' (...) could be dropped into Hyperborea with minimal effort. Check it out!" 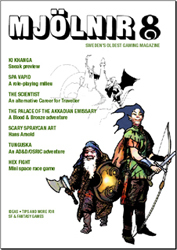 - Dave Prata, OSRIC/ Astonishing Swordsmen & Sorcerers of Hyperborea™ "
"Looks great (....) I am fascinated by the Yellow Submarine characters" - Chaosium Inc.
"Damn what a good feature! The photos! The stories! What a treasure!" Especially the article about the Wizard store, damn good (...) watch out Fenix, here comes a strong competitor"
No.s 1-2, 4-6 scanned by Martin in 2013, from the archives of Bo J. No. 3 scanned by Jani Gröndahl in 2013. All content © each author and illustrator respectively.